She has been counting down the days for two years..
We made a deal when she was only four. For her sixth birthday we would go to American Girl Place. This kid does not forget a thing. 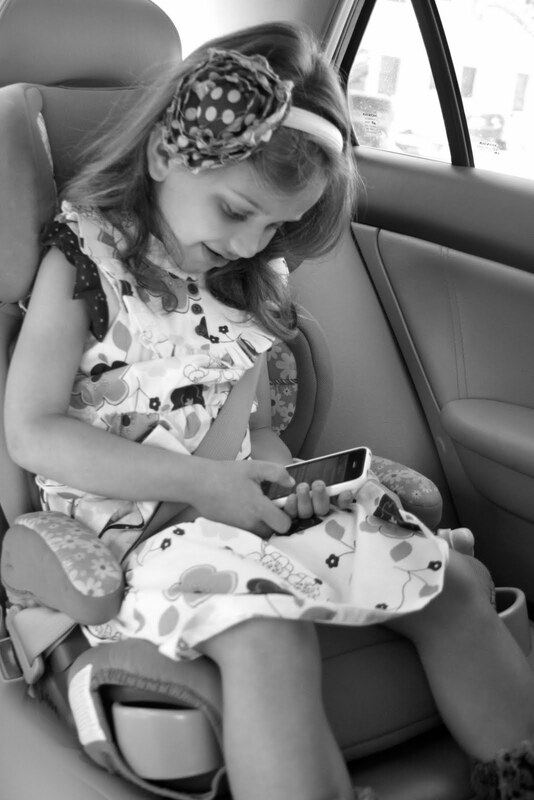 She borrowed my phone to text her daddy on the way up. Yes, she texts. I didn't teach her. She freaks me out. She takes pictures and sends them along with the texts too. Seriously. Is that normal? We went to The Grove which is basically a shopping wonderland. Celebrities, Anthropologie, happiness. But all of that was lost on Halley. She had a single minded focus. But there was no way to sway her. It has always been Kit. It will always be Kit. She pours over the each catalog. Dreaming about Kit. Picking out which outfits she will wear. The things that they will do together. How could I argue with that? Aunt Amy treated her to sweet Kit. She used her birthday money to buy Kit an ice skating and a sailor outfit. Because every girl needs a proper wardrobe. This place is a little girl's dream come true. The hair salon, cafe, picture studio, reading nook, hospital, nursery. We could come here every single day. I think that I loved it as much as she did. Of course, no girlie day can be complete without a yummy lunch. Nordstrom Cafe, obviously, as if there was any other option! She had her first taste of creme brulee. In fact she ate way more than her fair share. I think she has found her new favorite restaurant. Good thing I know how to raise her right! Now she is sleeping soundly with Kit snuggled up right beside her. It was such a special day. It takes the sting out of her growing up so fast, if only just a little bit. Today was for sure the best day of her young life. I took both my mom and my mother in law to the Grove specifically for the American Girl Doll store. It really is something to see. I must say I have always been partial to Kit too. Who wouldn't love a dress made from old flour sack fabric? My mother loves Felicity. My mother in law was just speechless! Just in case your newest member of the family is in need of some new clothes... here's a link to "vintage" American Girl patterns that are no longer available. Oh how fun! That is great! For Julia's 6th birthday I was shoping she would pick the 'Julie' doll, but she choose a 'Just Like Me' doll and named her Julie :) Close enough, right?! LOL! I took Kenzie about a month ago to American Girl. she LOVED it. Is it awful that a not even 2.5 year old loved that place. I was in heaven. I love American Girl. I think for Christmas this year, she'll get to actually pick a doll from the store. I wouldn't allow it this last time, cause even though she fully enjoyed it, I didn't feel like she was old enough yet. I love the pictures. And I heart that she got one. And that she spent birthday money on outfits. Such a girl thing. LOVE. Did the doll have it's own hairchair during the meal? Yup, Kit is a favorite in our home too. My youngest(4) got her for Christmas and my older daughter(6) got Molly(thank you Ebay!) when she was about the same age. Both of my daughters (now ages 23 & 25) diligently saved their allowances when they were young to be able to buy their American Girl dolls--Samantha and Kirsten---and I made tons of pretty clothes for each birthday or Christmas. I think it was as much for for me as it was for them! They've saved every tiny accessory for the chance that they will one day have daughters of of their own to share them with. ENJOY!! Oh what a fun day! I'm so jealous. We can't get those dolls down here and ever since Girl Spawn saw one in a book, she's wanted one. I might have to order online. Love the pics! So cute! That is a really special birthday! We love Kit too. I wish we could build a Kit treehouse in our backyard. Next year is Katie's American girl year. I only wish that we lived next to one. I bet it was a day that your daughter will NEVER forget. I have the Molly doll from when I was younger :) I'm glad she had such a good day! I still remember getting my American Girl doll. I had Kirsten. That was of course back when it was just Molly, Samantha, and Kirsten. Oh, how I loved getting her dressed. Loved each christmas and birthday after when I was get more clothes. This just made me happy. Maybe I will get to do fun things like this with my neice one day. Glad it was a fabulous day for all 3 of you. What a good aunt. I remember the day I got my first American Girl. It was Christmas '91 and I got Kirsten. I think she's retired now, not sure. But I loved her!! Oh the grand adventures that await your daughter and Kit! Happy Birthday sweet Halley! Chloe would be insanely jealous of that day! Nordstrom Cafe is our absolute fave too! What a fantastic day! I plan on getting my Claire an American Girl Doll for her birthday this July, she will be 6 also. I always liked Kit, but Julie is a great one too! talby has been saving for two months already and has plans for july to go to american girl in chicago. she dreams about it over adn over. she has never even see the front of a store....she just knows they must be awesome. what do you think her brothers will think of it? and how we annie get out of there with one? i just don't know?! maybe i will surprise them that day with "pocket money" :) oh that would be fun. they would definitely be VERY surprised. maybe just enough to buy one american girl doll....hmmm. or a giant lego set...or a dress a j.crew. i think i just came up with a fun idea! i am so happy for miss haley. what a treat! I love getting text messages from Halley. Especially when she calls me "Auntie Drue" :) I couldn't think of a better way to celebrate a 6th birthday! Hey, I'm still hoping to go to an actual American Girl store someday. p.s. Halley texting & sending pics? Looks like you have either an extremely techno-savvy girl here. cool! From one May 22nd girl to another - Happy Birthday Halley! Believe me, you will have oodles more fun with your new BFF Kitt than you would ever have with the silly sparkle shoes that come with some ugly scented makeup. I'm 22, and a trip to the American Girl Place would still make my day. We never made it to the Chicago one when we lived in St. Louis, but I hope to make it to the NYC one day. I own one of the original Kirstens. Back in the day when there were a total of 4 dolls to choose from and they had just introduced Felicity (she was #4). Every year for my birthday and Christmas, until I was about 12, my mom sewed one new outfit, and my grandmother bought one new outfit. She has quite the wardrobe now. She's all packed away now, but someday soon I was to take my nieces up to NYC, and of course Kirsten too! LOVE it! The girls have bitty babies that they love. They want one with hair...they tell me, daddy says no. I think for their b-day this year they will get the bitty twins. And then at 5 or 6 they can get the doll. Something about those dolls...I have a great seller on Etsy that I buy a ton of clothes from...email me and I will get you her information...she is good, really good! I loved these back in the days when it was just Felicity, Kirsten, Addy, Samantha and Molly. I still have Felicity, Kirsten, and Samantha and one of the dolls of "today" I named Julie after my mom. I guess I was spoiled because these days I realize that was a lot of $82 dolls. Where are Kirsten and Samantha on the site??? I guess they are retired? That is crazy. How fun! Amy is the best :) I had Kirsten back in the day and I'm pretty sure my mom kept it all in case I have a girl! Adorable!! That reminds me that I need to introduce my 5-year-old to the American Girl stories. We're reading the Little House in the Big Woods now and she's loving it. looks like such a fun day! i just had a little girl (april 19th) and I can't wait to do things like this with her! This is so sweet to read... I am looking forward to this new stage of my daughters life... being a big girl that she talks about. Thanks for the sweat story, what a fun girl day!